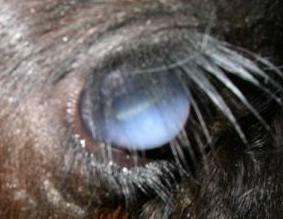 A good friend of mine from college days has just sent me some pictures of 2-3 day old calves – both Friesian and Angus cross animals – developing these white ocular lesions. They seem to resolve in a few days but no necessarily completely. What is happening and why? This is corneal oedema – sometimes there is so much excess water in the corneal stroma that the cornea swells and becomes deformed with a keratoconus. This can occur with malignant catharral fever or with phenothiazine administration but the cause here is still a mystery – plesae give me an e-mail if you have an idea! 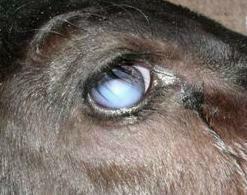 This entry was posted in Cases and tagged corneal oedema, Food Animal. Bookmark the permalink.